Mirah’s fifth album proper continues the chamber- folk, rock/pop sound that she has been nurturing and refining since her 2004 album “C’mon Miracle”. This is also -deep breath -- a break-up album but queer-identifying Mirah seems more inclined toward the very grown-up, conscious uncoupling of Gwyneth than that of, say, Fiona Apple. But saying that would also be doing this collection a massive disservice. “Changing Light” continues to showcase Mirah’s supreme knack of writing songs that charm and bewitch, and glorious melodies that have been a constant link through all of her solo work, but this time she really does mean business. Competing with the likes of the recent incarnation of Tegan and Sara as androgynous eighties prom sound-trackers and omnipresent recluse Sia, there’s a big and brilliant power ballad included here. It’s unexpected, not cynical in the slightest and conveys Mirah’s constant refusal to be pigeonholed into one, tidy category. She is making music now that is put together with staggering precision and beauty. The opening of “Changing Light” is undeniably strong and assertive and, while not exactly front-loaded, it does set the bar extremely high for the remainder of the album. ”Goat Shepherd”, with its Spectoresque drum intro, thunders in this accusing and extrovert album opener. Guitars and drums bolster Mirah’s incredulous concern ‘said the Shepherd to the Goat, what is this feeling in my throat? So this is anger? I’ve never known her -- she took over’. “Oxen Hope” is one of the best examples of Mirah’s ability to shapeshift and try on sonic cloaks which would normally be taboo within the genre. Electronic clatter, elegant but persistent, and unexpected auto tune caress Mirah’s vocals which, on this stand-out track, mourns the loss of eternal optimism; ‘did you know you’d struck the final blow to my oxen hope?’ “Turned The Heat Off” follows, the power ballad in question, and it crashes and glides its way through into the irresistible pop chorus before descending into delectable strings and a falsetto warmth that marks new territory for the singer; she succeeds effortlessly. Subtle strings continue through to “Gold Rush” and build to a full orchestra in the melodramatic and expansive final minute; a cello solo and yearning tone lead to an exquisite experience. Maybe sensibly, the sumptuousness established in the early part of “Changing Light” drops away for the middle part of the album with “Fleetfoot Ghost” and the rambunctious “I Am the Garden” being rawer, and stripped back acoustic examples of the core Mirah sound, but lacking the bite, maybe, of her earlier work. The excellent “No Direction Home” pulls the album back on track with its solitary brass opening, r’n’b backing vocals behind tight economic melodies and a great understanding of space and drama. “24th Street” is a plain speaking, humorous, recollection of how bad behaviour becomes second nature during the final hours of a long-term relationship. Closing tracks “LC”, a tribute to the healing power of Leonard Cohen set in a near accapella choral-like interlude, and “Radiomind” are downbeat and minor and somewhat stranded from the solidly cohesive sound preceding it. Relationship albums that come out this genre are usually easy to relate to and obvious; an all-encompassing weepie, histrionic angry interludes, self-love, self-loathing and nostalgia combined to make an overture to torment and rebirth. “Changing Lights” doesn’t feel like any of these things but these areas are, indeed, all covered. Mirah recounts her experiences in an even and indeed passionate way, lyrically she can be obtuse here and it would on occasion be a relief and a thrill to hear her disconnect from the sense of control and really let rip. It’s hard to imagine that there will be a fourth album in what feels like the natural end of a sonic trilogy. From the buzzy lo-fi indie pop and snark of “You Think It’s Like This But Really It’s LikeThis” which she debuted with in 2000 through to the ever more polished and sweeping sound of her work over the last decade, it does feel as though she has possibly peaked here with this sound. 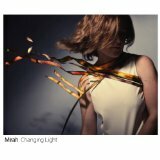 This album perhaps doesn’t expose her in the way one might have expected, considering its personal nature, but she continues to be one of the most thoughtful and surprising singer songwriters to come out of American over the last decade and “Changing Light” is Mirah’s most accessible and admirable release so far.